From On Liberty (1859), 107. Through the animal and vegetable kingdoms, Nature has scattered the seeds of life abroad with the most profuse and liberal hand; but has been comparatively sparing in the room and the nourishment necessary to rear them. The germs of existence contained in this spot of earth, if they could freely develop themselves, would fill millions of worlds in the course of a few thousand years. Necessity, that imperious all-pervading law of nature, restrains them within the prescribed bounds. 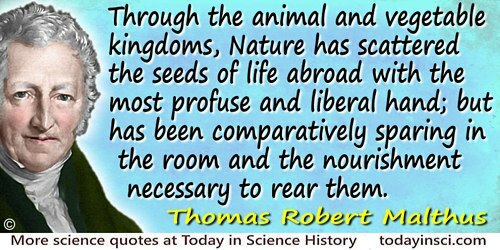 The race of plants and the race of animals shrink under this great restrictive law; and man cannot by any efforts of reason escape from it. In An Essay on the Principle of Population (1798), 14-15.